In the second part of our 3-part series on remarkable brands, this week we look at how you can build your own remarkable brand. Last week we introduced you to the very concept of a Remarkable Brand if you missed the article have a quick read first. This week, we’re helping you learn how to transform your very own brand into a Remarkable one. Read on to learn more! BUILD YOUR OWN REMARKABLE BRAND! 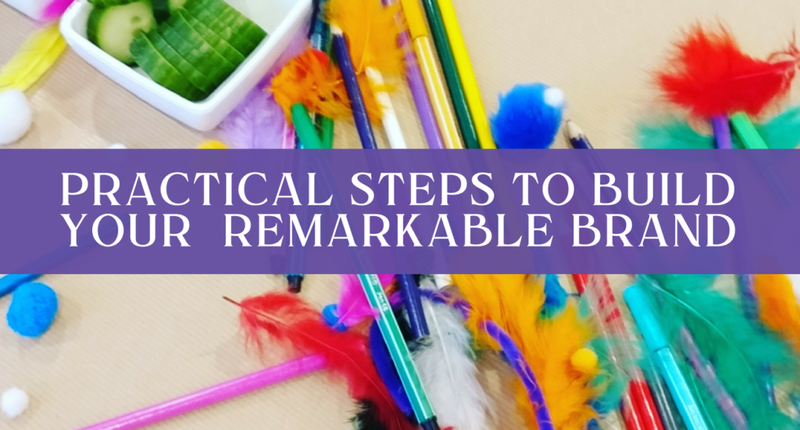 Now we’ve looked at what it means to be a truly remarkable brand in last week’s article, its time to show you the steps to build your own. As you may have guessed, much of this is rooted in our Strategy First concept, and for the right reasons. The vast majority of brands don’t become extraordinary by accident without working for it. Let’s look at some of the strategic steps you can make. Who is your brand speaking to? What do you offer them that your competitor doesn’t? And, what do you have that will improve the lives/work of these people? Unless you understand what makes your brand different and what it offers that the other 25,999,999 other businesses out there don’t then it’s hard to position yourself at all. Now that you know your audience, it’s time to position yourself in the marketplace. Brand positioning refers to the process of positioning your brand in the mind of your customers and understanding how to articulate your brand differences from your competitors. Do you know who your competitors really are? What other categories satisfy a similar need or provide the similar emotional reward that yours does? Read more universal brand positioning questions here. Like Dove and Patagonia in our top remarkable brand picks, they have a clear, unwavering mission that speaks through everything they do. Why? When you successfully create a connection with your customers and employees, many of them might stay loyal for life. That’s what you’re trying to do with a mission statement, connect. Here are some great mission statement examples. Build the best product, cause no unnecessary harm, use business to inspire and implement solutions to the environmental crisis. Patagonia grew out of a small company that made tools for climbers. What’s your brand’s core reason for being? Be aware of what’s out there, what your competitors are offering and how. Ignorance is bliss until you get blindsided by the competition. For each, what do they do well? Next, what do they struggle with? Finally, how can you leverage competitive brand differentiators to stand out? No matter what your business is, walk a mile in your customer’s shoes. Experience everything they do during every stage of interaction with your business. From landing on your website to email response time. Regularly experiencing and improving this cycle can build a strong loyal following and reputation for brand excellence. How do your customers get support from you and my team? How can you stand out in the eyes of your customers? At which contact stages are you extraordinary? And at which stages are you lacking and can you improve? Can you automate certain steps of the process that help bring better service to your customers? How can your become… remarkable yourself in the service loop? To many peoples surprise the visual aspects of building a remarkable brand come later, that’s because like I always preach its strategy first then design. What core motivations and desires do your consumers try to satisfy by using your category in general and your brand in particular, and which archetype best corresponds to this set of desires? Once you know who you are, It’s now time to discover, define and deliver. It’s the process that I take my own clients through in my brand elixir program. It’s all about brewing all the magic ingredients together and feeding everything back through to our business goals and mission. It’s easy for business owners and decision makers to get seduced by all the new trending digital tools available online that promise business growth and thousands of new followers for your social channels, but if you haven’t taken the time to delve down into the core of your brand and define it with the above steps, how can you expect people including employees to feel a connection? If you want happy, loyal customers that refer your business and sing your praises online and off, just get yourself back to these basics. Take your mind off Facebook and Instagram and how many likes and shares you can get, if you concentrate on building a remarkable brand that sells or offers remarkable services, people will share and follow. We hope you enjoyed this weeks article, build your own remarkable brand. But be sure to stay tuned, our follow up article is coming next week, we will be talking directly to some remarkable brands to learn about their journey from ordinary to remarkable.